The World of Collaborative Practiceis an online magazine published continuously with content changing at variable intervals to address the needs and trends in the profession. This is an international publication reaching both the professional world and the lay public around the globe. 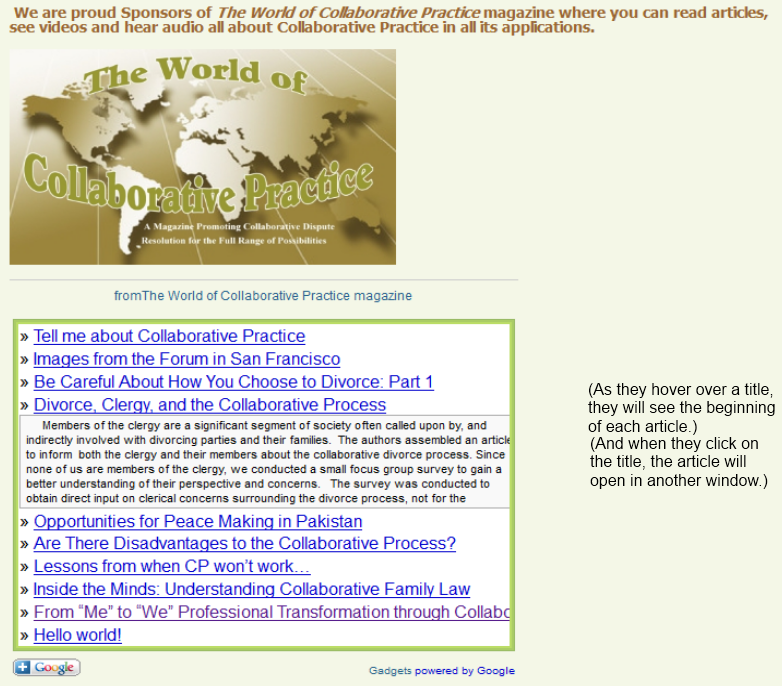 The World of Collaborative Practice welcomes advertisements and sponsorships from appropriate organizations, services and practices associated with collaborative practice around the world. Send all inquiries to admin@theworldofcollaborativepractice.com. The World of Collaborative Practice reaches a global audience of professionals from legal, financial and mental health professions and all of their related fields as well as a lay audience interested in issues of divorce, mediation, business negotiation, civil disputes, trust and estate settlements and a variety of other interests. The World of Collaborative Practice provides daily discussions, the latest developments and in-depth analysis of the techniques and trends in the collaborative field. From the independent practitioner to the international practice to the person on the street, The World of Collaborative Practice is the professional source for a broad audience. Your opportunity to reach them all is here. The World of Collaborative Practice reserves the right to refuse advertisers and decline sponsorships at our sole discretion and the acceptance does not imply the endorsement of the advertiser, organization, product or services. in our right hand column on every page of the magazine. Your training or educational opportunities for professionals and/or the public, can be featured as part of our “Learning Opportunities” section at no additional fee. Announcements by your organization can be featured as part of our “What’s News” section at no additional fee. in every entry of a specific section of the magazine, eg, appropriate ‘Talking With…” videos, target topic articles, ‘What’s News’, etc. We also are willing to work with you to develop something that serves your needs.